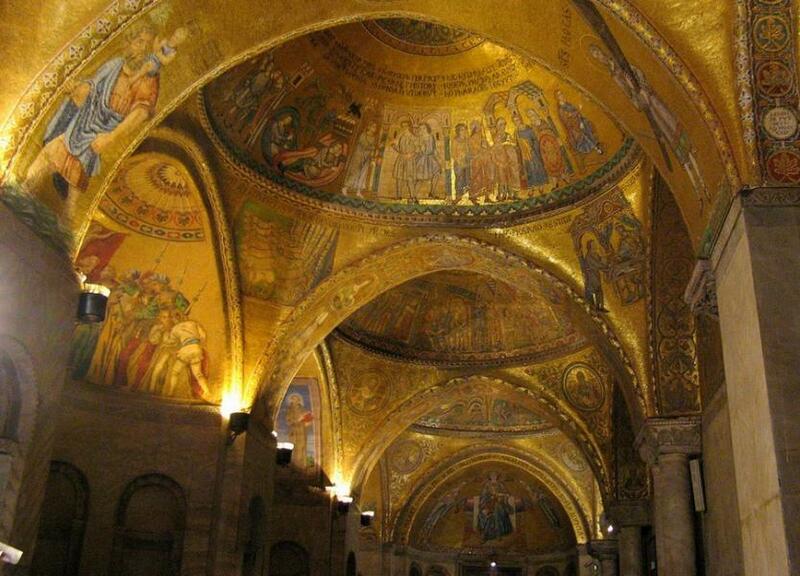 Basilica: a rectangular building, usually divided into three aisles by two rows of columns. In ancient Rome, this was the common form for law courts and other public buildings, and Roman Christians adopted it for their early churches. Ciborium: a tabernacle—a construction on or behind an altar containing the sacramental host. Confraternity: a religious lay brotherhood, often serving some specific charitable work. In Venice, where they were key to the city's social cohesion, they are called scuole. Contrapposto: artistic technique in which a figure is portrayed slightly off balance, with the weight more on one foot, to express either tension or relaxation. Invented in classical Greek sculpture and revived in the Renaissance. Ex-voto: an offering (a terracotta figurine, painting, medallion, silver bauble or whatever) made in thanksgiving to a god or saint. Graffito: originally, incised decoration on a building façade; only lately has the word come to mean spray painted messages in public places. Greek cross: in the floor plans of churches, a cross with equal arms. The more familiar plan, with a long nave and shorter transepts, is called a Latin cross. Palazzo: not just a palace, but any large, important building; the word comes from Rome's Palatium. Patera (pl. paterae) circular decorative element, usually carved, often taking the form of a rosette. Quadratura: trompe l'oeil (see below) painting, usually on ceilings, in which perspective is employed to make the architecture seem to continue up into the painting, creating an illusion of open, limitless space above. Trompe l'oeil: art that uses perspective effects to deceive the eye—for example, to create the illusion of depth on a flat surface, or to make columns and arches painted on a wall seem real. For geographical words, see here.